Recent improvements to the bike network continue to get more people cycling, but a new DOT report indicates there are bottlenecks at key points. After years of modest but steady increases, NYC DOT bike counts on the East River bridges fell slightly in 2017, according to the agency’s annual “Cycling in the City” report [PDF]. On its own, a one-year dip in one metric may not signify a broader trend, but citywide indicators like Census bike commute growth also show signs of tapering off. The number of New Yorkers who say they mainly commute by bike increased only slightly in 2016, the last year for which data is available, after several years of more robust growth. Digging into the details of the report, there’s evidence that recent improvements to the bike network continue to get more people cycling. But the de Blasio administration has to do more to move the needle and make bicycling safe and convenient for large numbers of people. Compared to 2016, last year DOT counted more people biking across 50th Street (7.8 percent growth) and 86th Street (19 percent). 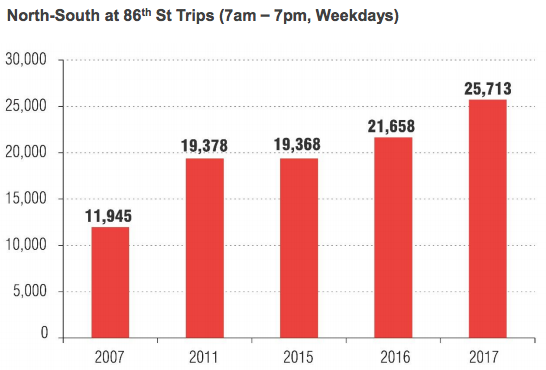 These increases are almost certainly due to better bike infrastructure on First and Second avenues and Amsterdam Avenue, as well as the expansion of Citi Bike uptown. Citywide, the U.S. Census Bureau publishes rolling three-year averages of the number of city residents who say bicycling is their primarily way of getting to work. After a five-year run where this metric increased by thousands of people each year (with jumps ranging from 1,900 to 6,100), the Census bike commute numbers increased just 800 in 2016, from 45,000 to 45,800. 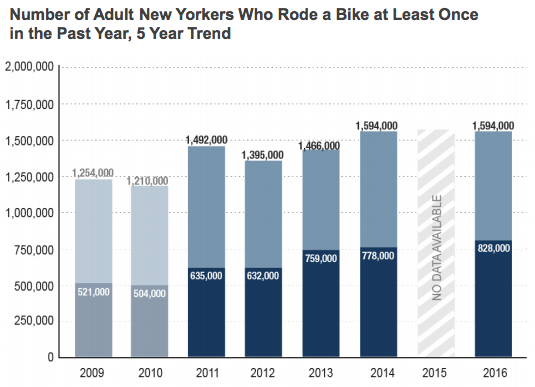 The number of New Yorkers who say they bike regularly (the dark bar) continues to increase, but the pace is not as strong as it was a few years ago. A closer look at the East River bridge counts, meanwhile, reveals both the success of DOT’s recent bike projects and some obstacles to continued progress. DOT’s bike improvements on Queens Boulevard and elsewhere in the borough — as well as the East Side of Manhattan — appear to be registering on the Queensboro Bridge. The 35 percent increase in daily bike crossings over the Queensboro since 2012 is more than on any other East River bridge. It’s also a sign that the city needs to expand capacity for cycling on the Queensboro. The bridge’s north outer roadway, which is shared by cyclists and pedestrians, is already a tight squeeze. Queens residents have pushed DOT to open up access for active transportation on the bridge’s south outer roadway, which is already closed to cars at night. In response, DOT Commissioner Polly Trottenberg has said opening up a lane for biking and walking is on the table, but no concrete steps have been announced. The downside of letting crowding issues fester is apparent on the Brooklyn Bridge. Daily bike crossings on the bridge fell 13 percent in 2017 and remain no higher now than in 2012. DOT is studying the expansion of the bridge’s narrow promenade, but completion of that project remains years away, if it’s feasible at all. The question is whether everyone who wants to ride a bike over the bridge is doing so. And if everyone who might want to if they tried it is doing so. The radical approach would be to provide simple bikes and riding lessons to middle schoolers, along with a “street certification” when they are proven safe, in the hopes that they’d keep riding as they got older. I would suspect that most of those riding a bike in NYC are from elsewhere, and learned to do so elsewhere, or are the children of those from elsewhere who learned how to do so elsewhere. You had an era in which the question is whether you’d be run over or have your bike stolen first that kind of cut off the habit here in NYC. The other angle, as I’ve said, is to get the health insurance companies involved, and have them subsidize bicycle transportation the way they subsidize health club membership. Street infrastructure helps, and has helped, but it isn’t everything. Perhaps a factor is that cycling across the East River is relatively strenuous, given the added distance and the climb, which dissuades the “less enthusiastic” cyclists. I still think we need a better way to count cycling. For example, just about any block I am on in Manhattan seems to genuinely have more cycling than it did a few years ago. And the constant stream of Citibike is evident. If they can find places to park the bike. And there is going to be spillover, too. Not only will the L be shutdown, but crowding on other lines will get even worse. Heck, I could even see the MTA using the extra G train services as an excuse to eliminate the F between Church and Jay. That’s why it pays to live in the Bronx!! 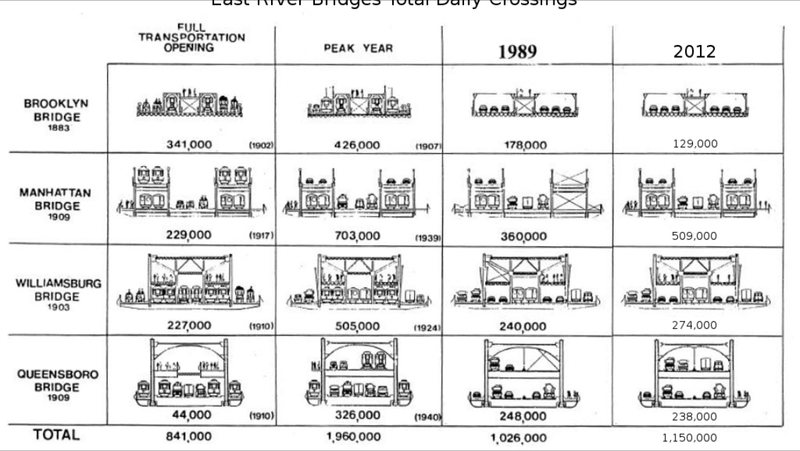 Lots of bridges. All relatively flat. Two that are for pedestrians and cyclists only. After a five-year run where this metric increased by thousands of people each year (with jumps ranging from 1,900 to 6,100), the Census bike commute numbers increased just 800 in 2016, from 45,000 to 45,800. Sounds like cycling overall in NYC is plateauing, not just on the East River Bridges. NYC is also still lagging way behind other cities. NYC needs better quality design for cycling, not just quantity of lanes. Riding up 1st Avenue or down 2nd Ave today is just not 8-80, low-stress design. Most people would rather walk or take the subway, and I don’t blame them. It’s high time to reallocate a motor lane on Brooklyn Bridge to cyclist improve throughout. 1) Neighborhood counts – For example Manhattan below say 34th is virtually Copenhagen. We should be counting the core area. 2) Bike to Car ratio on roadway. Many avenues have rush hour bike traffic as 20-40% of total traffic. Finally, Citibike numbers are off the charts. This February, Citibike exceeded 50,000 trips/workdayany times. At the typical 4:1 ratios that suggests in February, core cycling area has 200,000 trips/day. patterns, one can predict a 100,000 citibike day in Sept.
take that Dorothy Rabinowitz ! Based on the fact that, as John Liu noted, they are all going to sue the city, the City of New York should go bankrupt then. Imagine what actual good infrastructure would do. We have infrastructure, but I wouldn’t call it good. Now, if there were protected bike lanes on 5th going south and CPW going north, for example, that would be good solid infrastructure since the park negates turning traffic except at 96, 86, 79, and 66. 1st Ave, on the other hand, would have about 60 intersections, of which about 33 of them would include traffic turning across the bike path. Where would you rather ride? Note: while those transverses sometimes diverge at the entrance/exit of the park, their effect is the same since the splits are one way. I’m surprised they haven’t moved to make CPW one way with a bike lane. Fifth is tighter, with intense bus traffic, so it might not be as easy without actually losing the parking on the park side. Both Central Park West and Fifth Avenue have numerous bus stops along the park side, and your proposed bike lane conflicts with each of those bus stops. Bus volumes on Fifth Avenue are especially high. If CPW were one-way southbound and Fifth Avenue were northbound, I’d agree with your proposal. (Also, the bus stops would be more convenient for most riders.) But, alas, that ship has sailed. Pedal-assist e-bikes ARE legal. And BTW, the Bronx is NOT at all flat! The discussion here seems to be neglecting increased housing construction, instead focusing on CitiBike and bike infrastructure. Since 2012, LIC has gone from nothing to a dozen or more residential skyscrapers — whereas subway and roads from Queens were already saturated by 2012. Maybe that could be why bike traffic is way up over the Queensboro? Queensboro is for sure going to get more crowded. 2 years ago one of major reasons why people cited they ride there. With a little ingenuity, bus stops are moved into the space between the bike lane and the travel lane, instead of parking spaces. Or even make a bus lane curbside, with a bike lane attached to the left side of the bus lane, and protection to the left of that. As long as the bike lane is not wide enough for a bus to pass another bus, we wouldnt have to worry about a bus cutting in on a cyclist. My experience riding both roads considerably is that 99% of the bus drivers are very considerate to cyclists. And I’ve made a 511 report on each bus driver who was not. After the L closes, you may definitely see a lot more bike traffic on the Williamsburg bridge, and even the Manhattan that has a dedicated bike platform. But there is no reason to bike even farther from Williamsburg to take the Brooklyn Bridge. Anyone who thinks it is a good idea will realize it’s not the first time they try the BB promenade. I can only say for myself this reflects my evolution of biking. I used to try to use the Brooklyn Bridge. Compared with the Manhattan it has more pleasant views, a lesser incline and easier access from home and work. But the number of pedestrians walking in the bike lane has made it unusable. I’d use the Brooklyn again if a dedicated bike lane was created (as is being discussed) but until then, I’ll stick to the Manhattan. Center-City Bike Counts Rose 8% in 2013. Now, What About the Rest of NYC?